A Catholic child's "pictionary" of 240 inviting illustrations and 420 childlike definitions of all interesting Catholic persons, places, and things from "Abraham" to "Zeal" to which your child must be introduced. Bite-sized definitions and charming pictures satisfy the most challenged attention spans. By ages eight or nine, they'll be reading it all by themselves. Originally published in 1756 by the Catechetical Guild Educational Society with Cardinal Spellman's imprimatur. We've built this to last forever with a big 81⁄2" by 11" durable hardcover that will withstand rough treatment, your children's book box, and peanut butter and jelly. A title which should become a family standard. In 2005, 55 girls attended one of the many SSPX summer camps that year. But the girls of Camp Olmsted in Russell, Pennsylvania accomplished something quite extraordinary - something not even planned for. Their campfire singing was so good they called out a professional recorder to the camp and made this EXCELLENT CD of 22 Catholic and folk songs with instrumental accompaniment. You will be amazed at the quality of the singing and the recording. Proceeds from the sale of this CD go towards offsetting the cost of future girls camps. One of the most beautiful books ever written concerning Communion, Confession and Confirmation, the clearly written explanations and stories are just the thing for children of ALL ages. Fr. Halpin's charming, down-to-earth style of writing goes right to the hearts of children, completely captivating their attention. Helps parents and teachers explain the true essence of Communion, Confession and Confirmation - all in the form of a spiritual retreat. • how the scarab beetle sculpts his ball of food for home delivery • cause of a firefly’s glow • how the locust sings • the luxurious home of the cricket, an expert fiddle-player • the cannibalism of the pious-looking praying mantis • "grubby" adventures in rotted wood • the self-denial of a Spanish Beetle. Can bugs teach virtue to us? Maybe. Yummy! A biography of St. Pius X for youngsters 12 and up. The lessons given us by the life of the only Saint-Pope in over 500 years are in his poverty, charity and burning zeal for souls that should animate all of us. The purpose of this biography is to widen the circle of boys and girls, men and women who know him better and love him more. The perfect stocking-stuffer this Christmas! This book was so popular in 1938...it was later reprinted five times! For Christmas 2008, Angelus Press is reprinting this classic in vivid color. Features gorgeous illustrations representing each letter of the alphabet, with a short poem on each page. Built with a strong hardback cover to withstand a young child's playtime. * originally published in the 1938, and reprinted five times! tale of perseverance a book that you will read again and again. The result of 50 years of instruction in the art of business writing and ornamental penmanship to students the world over. Learn-at-home program combining instruction lessons, exercises, and advice to teach and recover the lost art of expressive handwriting. How handsome and unique is the handwritten letter in a the black-hole world of computer-printed and emailed correspondence. The Tamblyn Method concentrates on flowing and easy movement. Spiral-bound to lay flat. Translucent paper overlays to check angle and size of exercises. Your handwriting skill may inspire home copying commissions! In the depths of barbarism, the Catholic Church once preserved her most precious texts by having her monks copy and illuminate them. 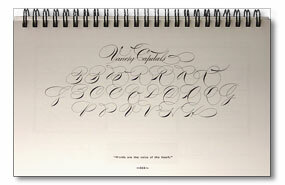 The new era of barbarity and illiteracy demands a resurrection of the art of penmanship. 174pp., all illustrated. Spiral bound. A very unique catechism for children around the age of First Holy Communion. Profusely illustrated in full color. Eleven chapters covering, in 96 questions: God, the Holy Trinity, the Angels, Man, Sin, Our Lord, Grace, Confession, Communion, Confirmation and the Blessed Virgin. Chapters include the common Q&A format, along with a "reading" which is broken into separate points and which explains the answers more thoroughly, an illustrative story, sidebars on the lives of child-saints, and a "Words to Explain" section. The centerfold is an EXCELLENT depiction of the workings of Sanctifying Grace...sometimes a difficult concept to communicate to children. 48 pp. softcover, 17 illustrations. Fr. R. C. Power, C.M. Originally published in 1960, Angelus Press was fortunate enough to acquire and sell thousands of originals in years past until those supplies dried up. We have now reprinted this classic in stunning full color. Originally published by the Catechetical Guild in 1754 (Imprimatur Francis Cardinal Spellman), this is a "comic" book unlike any other. Know Your Mass is a detailed, fully illustrated, step by step explanation of the Traditional Latin Mass now reprinted for the first time in full color! The book presents the theology of the Mass in a manner easily understood by children and yet is incredibly interesting and informative for adults as well. This should come as no surprise to those who have read The Seven Sacraments, another Angelus Press reprint by Fr. Manousos, who has the amazing ability to take solid theology and present it to children...without dumbing it down. He was truly a gifted writer. 96pp, softcover. Originally published by the Catechetical Guild in 1755 (Imprimatur Francis Cardinal Spellman), this is the "comic" book companion to Know Your Mass. Both illustrated by Addison Burbank in full color. The book presents the life of Our Lord from the Annunciation to His Ascension in a manner easily understood by children. Adults will find the seamless integration of the Gospels informative as well. 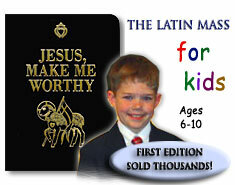 An ideal companion to Know Your Mass, which presents the unbloody Sacrifice of the Mass...here, children learn to know and love He Who is the Sacrifice. Even students who excel in religion class often do not KNOW Our Lord...they don't yet understand Scripture, the Gospels do not read like the stories they are used to. The Life of Christ introduces them to their Savior in a way they can understand and love. Great for religion classes and makes an excellent gift for the Feast of St. Nicholas, Christmas, Epiphany, Easter, First Holy Communion, name days, birthdays, etc. Highly recommended. Originally published by the Catechetical Guild in the 1750's, this is the "comic" book companion to The Life of Christ. Both illustrated by Addison Burbank in full color. 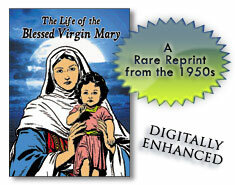 The book presents the life of Mary in an engrossing full color "comic"-style format. Starting in the Garden of Eden when God promised to send a woman who would battle Satan...a battle "between thy offspring and hers" through her Assumption into Heaven. Adults and children alike will find the seamless integration of the Gospels informative. An ideal companion to Know Your Mass, which presents the unbloody Sacrifice of the Mass...here, children learn about she who best assisted at the bloody sacrifice of Calvary...she who we are to imitate in our assistance at the unbloody Sacrifice of the Mass. “The finest written for children,” says the head of Our Lady of Victory School. The life of St. Therese written for children, as told to the author by the Little Flower’s own sisters. "She was very happy and full of fun, but she never forgot that we cannot always be happy in the world but must wait for the perfect happiness of Heaven. Sometimes, too, she cried as you do, but she bore her little troubles bravely to atone for her childish faults and for the sins of others….God gave her very special gifts; a remarkably quick intelligence, deep power of affection, and great personal charm. But all these gifts are nothing in comparison with her deep love of God, and you can all imitate her in this." Originally published in 1758, we, at one point, acquired and sold thousands of originals. After those supplies were exhausted, we decided to reprint this classic in full color. • Meaning of the altar, altar cloths, crucifix and candles, sacred vessels, bells, incense and more! Hundreds of questions answered with thirty-six beautiful illustrations. Dramatic and detailed etchings make this a very special book for children. A pictorial Ignatian retreat, it helps children ponder the truths of the Faith and calls them to lead lives of holiness in accordance with those truths. The illustrations reveal the heroism and adventure of the Christian life, and the questions on each chapter help children to remember what they've learned. For children 3-5 years old. Includes beautiful color pictures for Holy Mass. Fosters correct sentiments for Our Lord, Our Lady, and Saint Joseph. Articles of Faith and prayers to Jesus and Mary are set in verse. Excellent bedtime storybook. 396 full-color stickers in all - one for each saint and feast day of the liturgical year (according to the 1962 Roman Missal). That's thirty-three stickers per month, spread across twelve 8.5" x 11" sheets (one per month). A separate booklet (included) has a thumbnail biographical sketch of each saint and feast day. 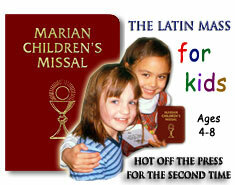 Perfect for integrating the liturgy into your family life and particularly useful for children. Put a different sticker on your liturgical calendar every day and read the little description of the saint or feast day. Many families make this a daily morning routine, with children taking turns reading the mini-bios and affixing the stickers to the calendar. Kids love it! Sr. M. Imelda Wallace, S.L. story that most will want to read and read again! The book presents the theology of the Mass in a manner easily understood by children and yet is incredibly interesting and informative for adults as well. This should come as no surprise to those who have read The Seven Sacraments, another Angelus Press reprint by Fr. Manousos, who has the amazing ability to take solid theology and present it to children...without dumbing it down. He was truly a gifted writer. One of the best gifts you can give a child is a better understanding of the Faith. That's what you'll do with this beautiful book, The Seven Sacraments. Fr. Manousos explains the mystery of sanctifying grace in a profound and memorable way, based on Saint Thomas Aquinas. He compares our natural development (from birth to death) to the life of our soul...our "super-life." At each step of our two lives, we encounter special events along the way. In our "super - life," the life of grace, these special events are the Sacraments. The matter, form and effects of each sacrament is explained to give children a basic, but solid understanding. With over 50 beautiful color illustrations, your child will get hours of enjoyment just looking at the pictures. Ideal for children 5 to 10 years old. Durable hardcover. The book could be read to younger children and even though they would not grasp all the concepts, it would help to familiarize them with important sacramental words and images. Older children will enjoy the book too! Fr. Joseph Spillmann was born at Zug, Switzerland, April 22, 1842. He joined the Jesuits and in 1874 was ordained priest. languages. Newly reprinted by Angelus Press, Volume One combines four of these stories into a single volume. A book Bishop Tissier de Mallerais wants boys to read because the Catholic Church wants them to grow up to become providers, protectors, and guides. • campground shelters • forest furnishings • tent construction and placement • mastering the outdoors • outdoor innovations • angling for the big fish • the reel deal • terrific tackle box • the perfect fly • cleaning the catch • canoeing and paddle power • archery • campfire grub • camp kitchen gadgets and appliances • the open-air feast. War on boredom and couch potatodom. What to do when no Wal-Mart is near you. Buy it; you’ll make it! 255pp., durable color flex-cover. Hundreds of drawings, illustrations, photos, diagrams, and blueprints. Indexed. Women and girls, look for this guy! Guys, what can you make without electricity? With the rawest of materials, a minimum of technology, and a maximum of ingenuity, men and boys used to dedicate themselves to crafting wonderful items, both practical and fanciful. These were skills that revealed an important part of the measure of a man. By recalling them, this book honors those handy and remarkable fellows hard to find in our high-tech era but whom the Catholic Church wishes to return. Wasn’t Our Lord a Carpenter? • make tools like T-squares and sawhorses • animal-proof gate latch • birdhouse made from an old hat • mission-style candlesticks • toys like a miniature fighting tank and paper warship • puzzles • card tricks • marksman aids • Chinese kite • gardening tips • bee feeder, portable fences, self-closing gate • axe handles and heads. 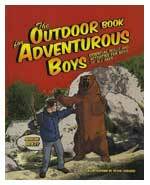 A book to inspire a working knowledge of the general sciences, a proficiency in outdoor skills, and an ability to craft projects in wood and metal. Fascinating and encouraging stuff. 272pp. Durable color flex-color. Hundreds of drawings, illustrations, diagrams. Indexed. is the perfect gift for every budding young mad scientist! children—the chance to pray with less distraction. 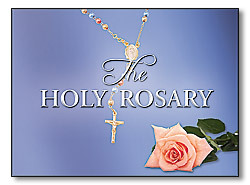 Once you see it, you will want to own this beautifully remastered, full-color rosary book. distractions once and for all with The Holy Rosary—in pictures. about the world away from MySpace, text messaging, and reality television. who want to pass on their love of the outdoors! This book needs to be seen to be fully appreciated. Originally published by the Catechetical Guild in 1755 (Imprimatur Francis Cardinal Spellman), this is a "comic" book unlike any other. The Sacraments is a detailed, fully illustrated, step by step explanation of all seven sacraments. The book presents the theology of the sacraments in a manner easily understood by children and yet is incredibly interesting and informative for adults as well. This should come as no surprise to those who have read The Seven Sacraments, another Angelus Press reprint by Fr. Manousos, who has the amazing ability to take solid theology and present it to children...without dumbing it down. He was truly a gifted writer. 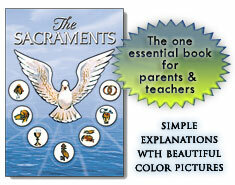 This makes The Sacraments an excellent catechetical tool for all ages. All parts of the sacraments are explained: matter, form, minister, intention, Biblical basis, liturgical actions, including helpful suggestions for children to best prepare for the reception of the sacraments. 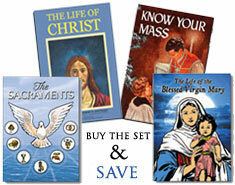 Covers all seven Sacraments in an engrossing full color "comic"-style format. A perfect companion to Know Your Mass. In Heaven, where they know what is really important, they marvel that we fail to see that our Lady's coming to Fatima is the most tremendous event of the 20th century. Our Lady's message for the whole world was entrusted to three children: children, then, have the right to hear all about it, and are disposed to understand what our Lady wants and to cooperate with her requests. This book is for them. No more enthralling story was ever told and this story is true!
? ?ants’ underground cities ? spiders' suspension bridges ? habits of cows and sheep ? length of plants and animal life ? insect venom ? the properties of metals, gold, the iron kettle, metal plating ? fleece, flax, cotton, paper, rope ? thunder and lightning ? clouds ? experiments with cold water and cats ? sun, moon, stars, and sky ? poisonous plants ? volcanoes ? fruit, pollen, bees, honey ? mushrooms ? earthquakes ? seasons ? shells, snails, pearls, caterpillars, silk ? sea, salt, waves. More important than ever (first published in 1917) in a world going virtual. Stock up your child’s experiential storehouse of knowledge with this miraculous and marvelous treasure hunt. You and your child learn something new every day. If God so takes care of his plants and animals, how much more us? 438pp. 6" x 9", softcover. Illustrated.